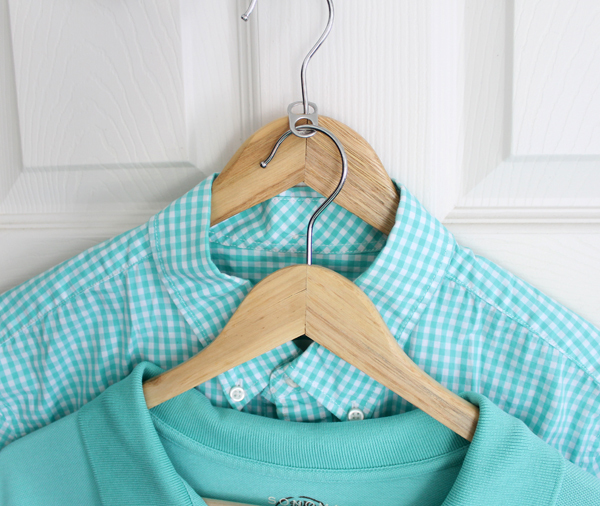 Pair up several items on the same hanger using soda can tabs. Save yourself time in the morning and space by using soda can tabs to layer up your outfits inside your closet. Your outfits can be planned ahead of time and things will be simpler in the morning. Using less hangers on the rod means more items can be stored there. Cut boxes to create custom drawer organizers. Use old boxes to make compartments for your clothing items. Folding your clothes into your drawers is great, but unless they are compact, things become disorderly in the drawer quickly. Cut old shoe boxes or gift boxes to make custom sized compartments. Display your scarves using shower curtain rings. 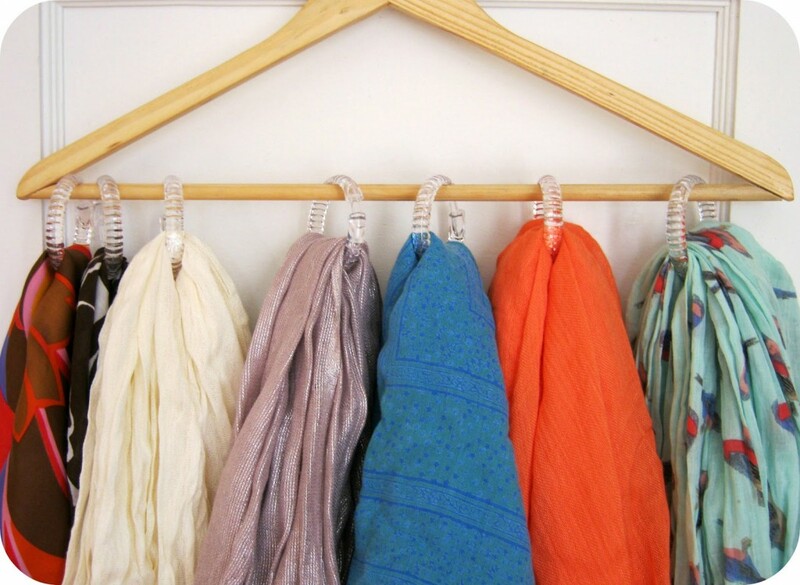 Hang your scarves neatly on a hanger or rod by looping them through shower curtain rings. This genius hack will save you tons of space and is so affordable. You’ll never spend your evening searching through crumpled scarves again and your scarves will be unwrinkled and ready to wear. 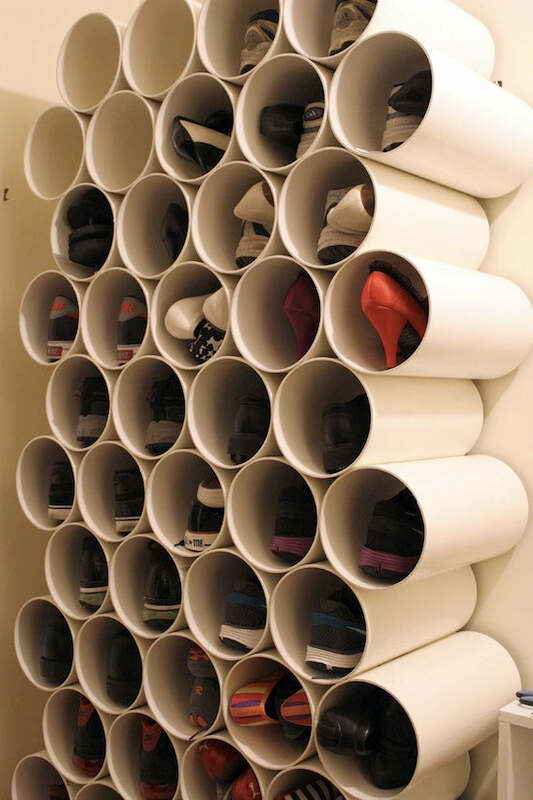 Create a PVC pipe shoe organizer. Just have 6 inch wide PVC pipe cut at your local hardware store into as many 12 inch long sections as you need. Wash your pieces using dish soap and sand around the edges to soften the openings. Glue the pieces together in a honeycomb shape using PVC glue and clamps will hold them together as they dry. Use a tie hanger for tank tops. Tank tops are such an essential, you may find them taking up lots of room. You can easily hang them on a tie hanger and you’ll be able to see them much better than if they were stashed inside of a drawer. They will be easy to grab in the morning too, saving you time. Store out of season items in a vintage trunk. Don’t clutter your closet with out of season clothing. Take out anything you aren’t currently using and store it inside of a chic vintage trunk. The trunk can double as a table and will add a special touch to your decor. Build an extra rod outside your closet out of piping. 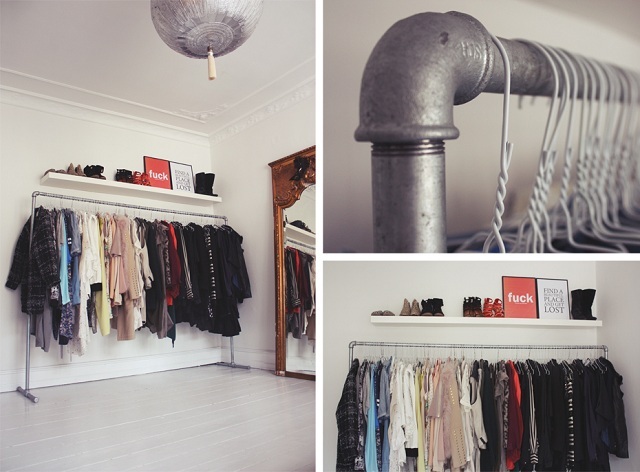 You can make a free standing industrial style rack to hold extra items that don’t fit into your existing closet with just a few supplies from your local hardware store. Just use curved pipe angles for the ends and create a custom rack to fit in any space. The parts are easy to attach since you simply screw them into one another. You can keep the industrial silver color or paint it with a color that matches your decor. Modify a standard tie rack to hold twice the amount. Ties can take up a tons of room in a closet. Most tie hangers are flimsy and won’t store as many ties as they advertise. To make a better version of the standard rack take a hanging tie rack and lay it flat on it’s side. Attach plastic hangers with cable ties into each side hook. Create a triangle with the new tie rack and hang it in your closet. Not only is it more sturdy, but you can now store about twice the amount of ties than you could with the normal rack. For more ideas and home hacks visit Modernize.com.